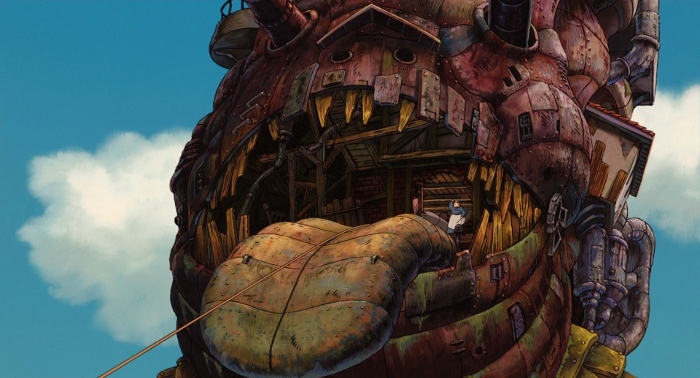 Some films just can't be summarized in one sentence, and Hayao Miyazaki's Howl's Moving Castle (2004) is one of them. Based on the 1986 novel by Diana Wynne Jones, this tale of a young woman named Sophie and her unlikely relationship with a handsome wizard doesn't take long to venture into all manners of the imagination. Mature, wise and painfully dull beyond her years, Sophie encounters the wizard Howl but doesn't realize he's being pursued by an evil witch; at her hands, she quickly finds herself in the body of a 90 year-old woman. Surprisingly undaunted by her fate, the spry Sophie enters Howl's mysterious castle in an attempt to break the spell. It's also occupied by the young apprentice Markl and Calcifer, a fire demon who powers the castle and seems physically connected to the cursed Howl. Together, these outcasts form an unlikely family unit amid the backdrop of a country caught in a long, senseless war. I didn't catch Howl's Moving Castle the first time around, as I vaguely recall seeing promotional posters at my local theater but the film showed for less than a week. 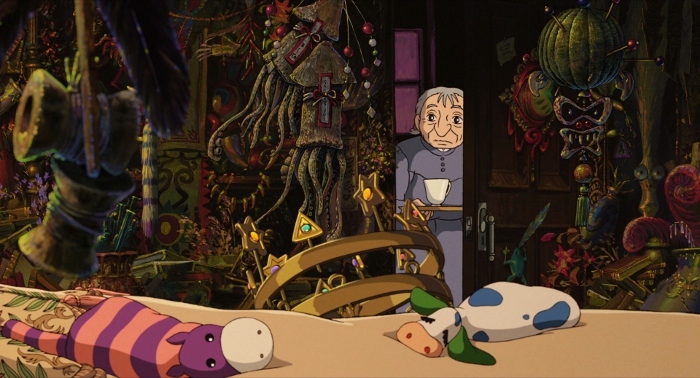 As luck would have it, Disney released a Special Edition DVD of Howl's Moving Castle in 2006 after earlier Miyazaki releases like Spirited Away and Princess Mononoke generated a solid amount of fan interest. Though most of Howl's Moving Castle isn't as consistently compelling as either of those two, this slice of (mostly) hand-drawn animation is worth seeking out whether you're a die-hard Miyazaki disciple or relatively new to the acclaimed director's vast body of work. Disney's Blu-ray was simultaneously released with My Neighbor Totoro one week ago...and while they make for an unusual double feature, both films certainly have their share of strengths. It's rare that I watch any film twice before a write-up (time constraints, more than anything else), but this particular presentation of Howl's Moving Castle demanded a second viewing. Not having seen it in several years, I refreshed my memory with the original Japanese audio mix, presented here in DTS-HD 5.1 Master Audio. I then watched the film with its English dub, crafted by Disney for its 2006 Special Edition DVD. This yields a dramatically different end result (and one that's not vastly better or worse), partially due to the slightly revised English script and a familiar pool of voice actors. Damning with faint praise? Perhapsâ€¦but with no shortage of horrible English dubs out there, this is about as passable as it gets. So on the audio front, the greatest strength of Howl's Moving Castle on Blu-ray and DVD is that it caters to those on both sides of the fence; likewise, this combo pack includes both formats. Equally reassuring is that its rich visuals look ridiculously good in high definition, from the colorful character designs to a countless number of intricate, detailed backgrounds. Perhaps the only flaw here is a lack of compelling extras; though they're all ported over from the old DVD release, these supplements are either promotional in nature, painfully outdated or...well, just not very entertaining. Luckily, the movie's still pretty good. Presented in its original 1.85:1 aspect ratio, this 1080p transfer of Howl's Moving Castle looks flawless from start to finish. Contrast and black levels are strong, no dirt or debris was spotted along the way and the color palette appears rich and vibrant. Luckily, digital imperfections are also virtually absent, including edge enhancement, banding and compression artifacts. The film's detailed background designs are quite eye-catching and strong enough to warrant the occasional double-take. Overall, Howl's Moving Castle is simply a fabulous looking production which has thankfully been treated with white-glove care. DISCLAIMER: These promotional images are strictly decorative and do not represent Blu-Ray's native 1080p resolution. The audio may not reach the same heights, but it's still quite excellent. For starters, both the original Japanese audio and Disney's 2005 English dub are presented in DTS-HD 5.1 Master Audio...and though I usually avoid dubs like the plague, this one's actually quite good. Christian Bale feels slightly out of place here, but many of the supporting voice actors make the most out of the lightly revised script, which should provide curious viewers an interesting alternate experience after they've digested the original Japanese track. Both options feature crisp dialogue, good dynamic range and solid channel separation, while the rear channels favor more of Joe Hisaishi's score than the ambient effects. Overall, both these mixes are a bit more front-heavy than I'd have liked on several occasions...but on the sporadic occasions when Howl's Moving Castle springs to life, this Blu-ray certainly doesn't disappoint. We also get English SDH "dubtitles" and proper English or French translation subtitles, as well as a French Dolby 5.1 dub. Seen above, the plain-wrap menu designs are lightly animated and easy to navigate. This 118-minute film has been divided into more than a dozen chapters, no obvious layer change could be detected and the main menu is prefaced by a handful of trailers, logos and advertisements. This two-disc release is housed in a dual-hubbed keepcase and includes one Disney Movie Rewards insert and a matching slipcover. Not too much, unfortunately, though everything's been carried over from the 2006 Special Edition DVD. These recycled extras include a rather bland "Behind the Microphone" featurette concerning the English dub, a short Interview with English dub co-director Pete Docter shot for Japanese TV and a brief glimpse of Hayao Miyazaki's Visit to Pixar from June 2005. These Disney-centric extras are kind of off-putting in general, as several statements really undercut the integrity of the film's original language track. The recycled Japanese extras aren't much to write home about either, though. These include a short collection of vague Trailers & TV Spots and a complete Storyboard Presentation that plays for the entire length of the film. This might be helpful if you're really, really into that aspect of filmmaking, but it only held my attention for a few minutes. All applicable bonus features include optional English subtitles. 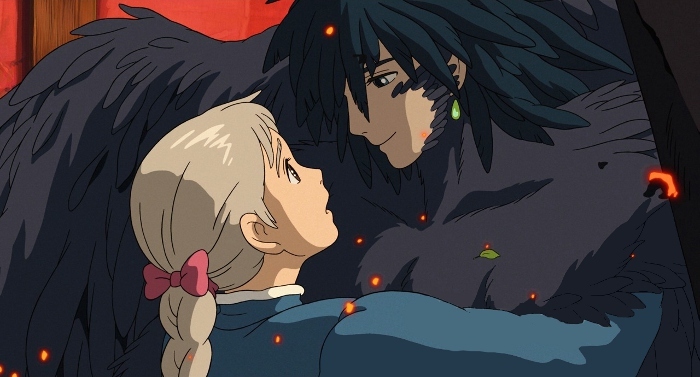 Though not without a few nagging faults, Howl's Moving Castle is another confident, entertaining Studio Ghibli film that continues to carry a torch for hand-drawn animation. Showcasing a number of memorable characters, detailed designs and interesting locales, portions of this visual tour de force will stick in your brain for days at a time. 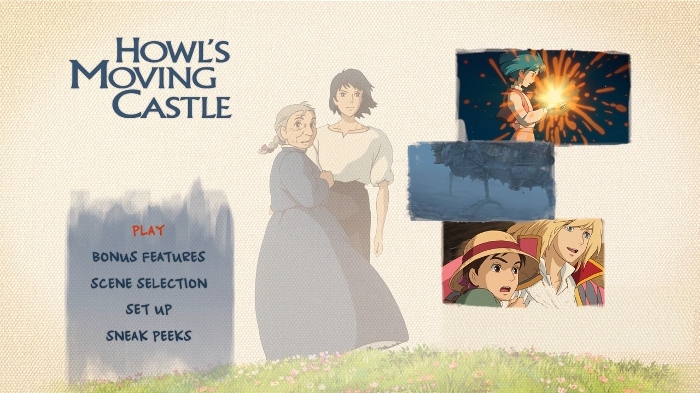 Disney's Blu-ray combo pack serves up a near-perfect technical presentation but stalls a little bit on the bonus features, which either makes Howl's Moving Castle a worthy purchase for established Miyazaki fans...or just an expensive demo disc. Either way, this one's Recommended.